Hospice Caregiver of the Year for 2016 is Michael Blair! January 2017 Caregiver of the Month is Amanda Estep! “Amanda was a most compassionate caregiver for Crystal Isaacs particularly during the last month of her life. She went above and beyond the call of duty on many occasions. 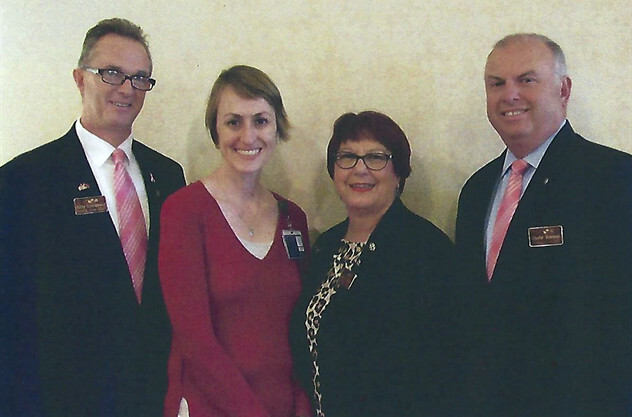 I know that her excellent level of caregiving helped to allow Crystal to stay in her own home. Congratulations Amanda for a job well done! February 2017 Caregiver of the Month is Brooks Monroe! 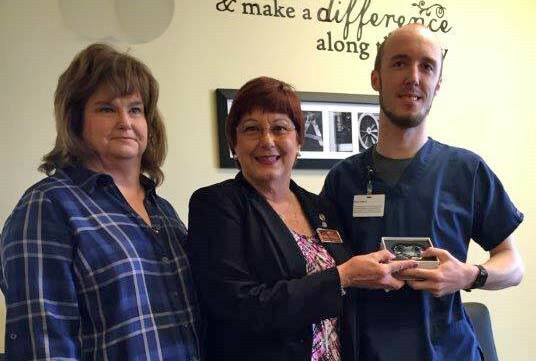 Brooks Monroe, RN with Avalon Hospice is the winner of the February 2017 Hospice Caregiver of the Month Award presented by Tetrick Funeral Home. “Brooks was very compassionate! His ability to bring peace and comfort to our family was amazing. He is truly using the gift God gave him. The hospice services that are given were invaluable not only to Jan but to anyone who may find themselves in need of this type of care. Congratulations Brooks for a job well done! March 2017 Caregiver of the Month is Scott Murray! 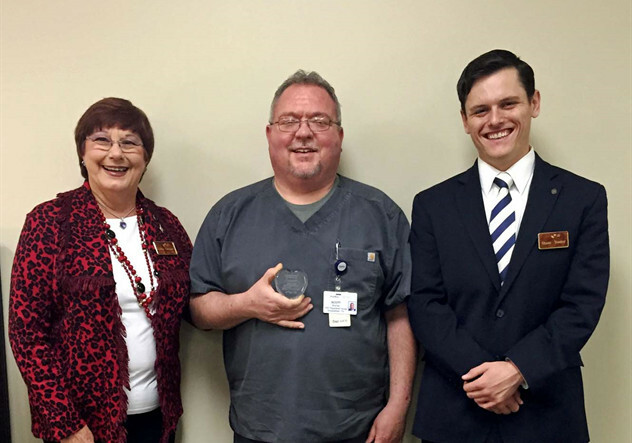 Scott Murray, RN with Amedisys Hospice is the winner of the March 2017 Hospice Caregiver of the Month Award presented by Tetrick Funeral Home. 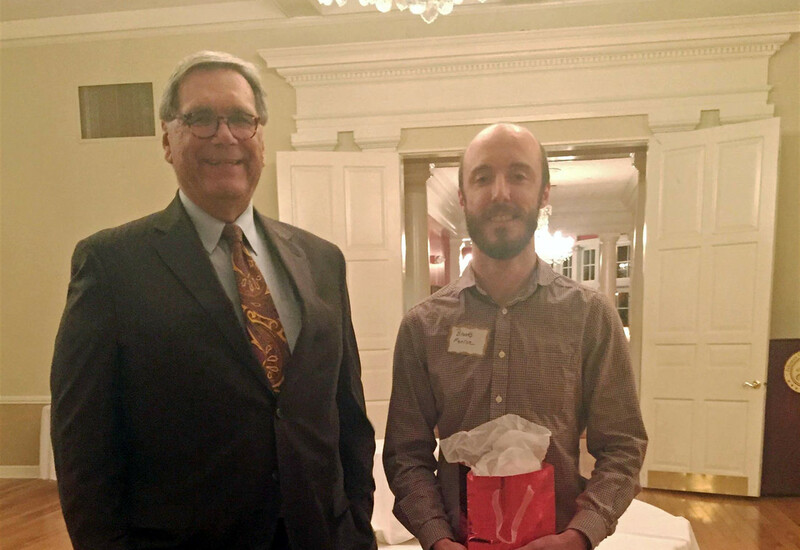 “Scott went above and beyond in his care of our late patient Jack Lewis. In conversation during his visits, Mr. Lewis expressed to Scott how much he loved his screened back porch which is where he and his wife Charlotte would sit, have coffee, and enjoy each other’s company. It was his favorite place in the house. Once his condition declined to the point that he was no longer able to ambulate, he found that he could no longer navigate the large step to get down from the kitchen to the screened porch, and he missed being able to spend time there with his wife. Scott gathered his tools, wood and other building supplies and went to the Lewis family’s home during his weekend time off. He built a ramp for them so that Mr. Lewis could come down into the porch in his wheelchair. We have a photo of their final time there. Scott’s action reminds all of us to do the best that we can to serve others with the tools and talents we’ve been given. Scott’s commitment to this patient’s care as well as his willingness to sacrifice his own time and resources make him my nomination for the Hospice Caregiver of the Month award. The hospice services that are given were invaluable not only to Mr. & Mrs. Lewis but to anyone who may find themselves in need of this type of care. Congratulations Scott for a job well done! April 2017 Caregiver of the Month is Sarah Bowling! “What does it take to make a great hospice nurse? Someone who is smart, who listens, and seeks to understand what the patient needs, and one who knows about medications and various interventions that might bring comfort. But most of all, someone who is kind and compassionate, who speaks gently and lovingly to people when they are in a crisis. Sarah Bowling does all of this. The funny thing is, however, that I have never actually seen her physically at the bedside. As difficult as it can be for a nurse to care for a person and their loved ones when they are present with them, Sarah’s skill allows her to have that loving care for the patient even though she is in our office. The patients know her by name and trust her to take care of their needs. If a person were to eavesdrop on her, they would hear her give instructions on medications one minute and offer condolences to a family member in the next phone call. Sarah knows the patients by the sound of their voice, and patients often insist on speaking with her since they know Sarah will take care of them in the way they need. Congratulations Sarah for a job well done! May 2017 Caregiver of the Month is Roseanna Hammonds! 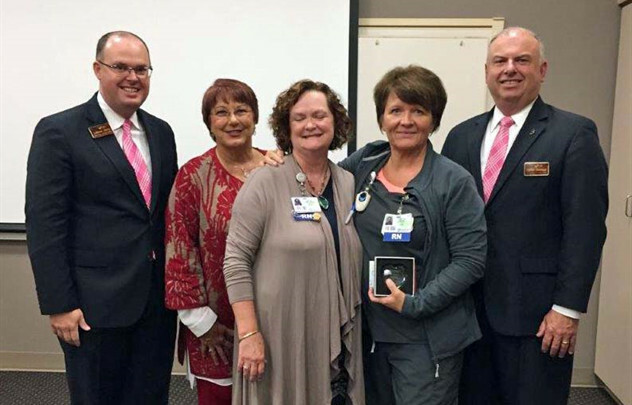 Roseanna Hammonds, CNA, with Amedisys Hospice in Kingsport, TN is the winner of the May 2017 Hospice Caregiver Award, presented by Oak Hill Funeral Home. Congratulations, Roseanna for a job well done! June 2017 Caregiver of the Month is Crystal Bentley! 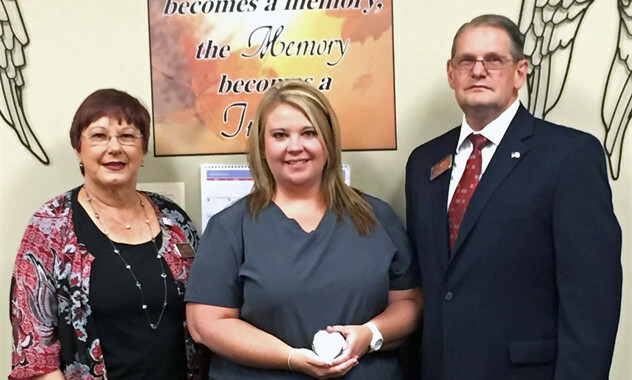 Crystal Bentley, RN with Amedisys Hospice in Kingsport, TN is the winner of the JUNE 2017 Hospice Caregiver Award, presented by Oak Hill Funeral Home. Congratulations, Crystal for a job well done! July 2017 Caregiver of the Month is Ben Kilgore! 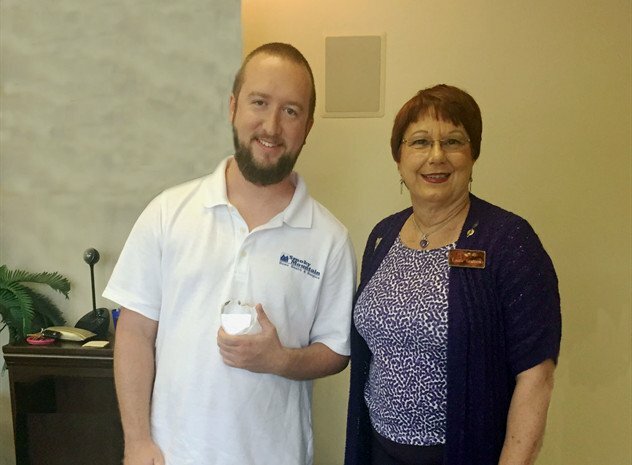 Ben Kilgore, CNA with Smoky Mountain Hospice in Kingsport, TN is the winner of the July 2017 Hospice Caregiver Award, presented by Oak Hill Funeral Home. 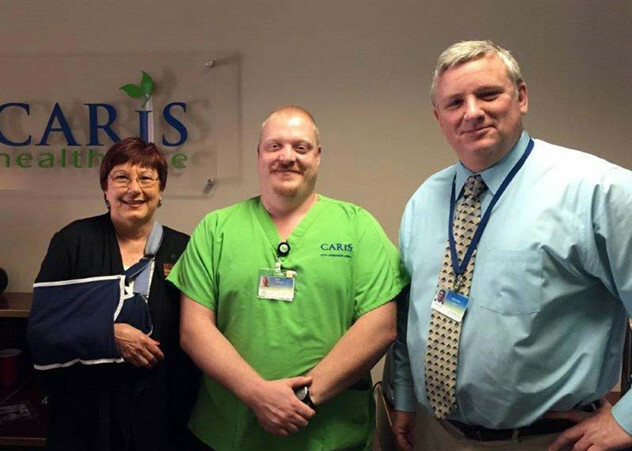 “Ben Kilgore is a compassionate, caring, and professional caregiver. Each time he came to bathe my Father, he did his job in a gentle and patient manner. In addition to his wonderful work, he is working on his degree in nursing and taking care of his family! My daughter came in from out of state to help with Dad’s care. She is a registered nurse and she saw Ben at work. She would not only give her personal but her professional approval for Ben receiving this award. Our whole family would give one hundred percent approval for Ben to receive this award. Congratulations Ben for a job well done! August 2017 Caregiver of the Month is Mary Phillips! 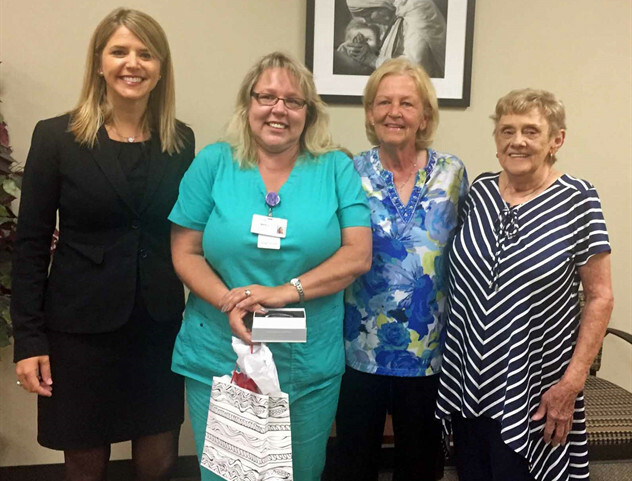 Mary Phillips, RN with Amedisys Hospice in Elizabethton, TN is the winner of the August 2017 Hospice Caregiver of the Month Award presented by Tetrick Funeral & Cremation Services. “Mary was so caring and walked us through and prepared us for all Mom was going through. She told us when to expect her kidneys to start to fail and for her fluctuating blood pressure to begin. Mary kept us up to date on everything to expect in Mom’s changing physical condition. We know that she truly cared about my Mother. Mary not only talked to Mom about physical issues but they shared stories and talked as old friends would. On the days that she did not see my Mother, she would call me and check not only on my Mother but also cared about how I was holding up and doing. We could not have had a more caring and professional caregiver had we had the privilege of choosing her ourselves. Congratulations Mary for a job well done! September 2017 Caregiver of the Month is Freyda Osborne! Freyda Osborne, RN with Wellmont Hospice is the winner of the September 2017 Hospice Caregiver Award, presented by Hathaway-Percy Funeral Home. “Freyda cared for my mother, Margaret Gould, for 8 months. During this time she never missed checking with her every week. Even when she was off due to her surgery and another nurse came to the house, Freyda checked on her by phone and when my Mother was an inpatient at Wellmont Hospice House, she went to see her. We live in upper Stoney Creek and making it up here in winter can be hard. Freyda never missed. My Mother lived with me and our family dynamics had its challenges yet Freyda never let them interfere either with my Mother or with me. In the last month when my Mom was only semi-aware of her surroundings, Freyda was always there to help. Given where we live, the length of time my Mother was under hospice care, and the challenges of our “family life” Freyda certainly went the extra mile --- all of the time. Congratulations Freyda for a job well done! October 2017 Caregiver of the Month is Anna Butler! 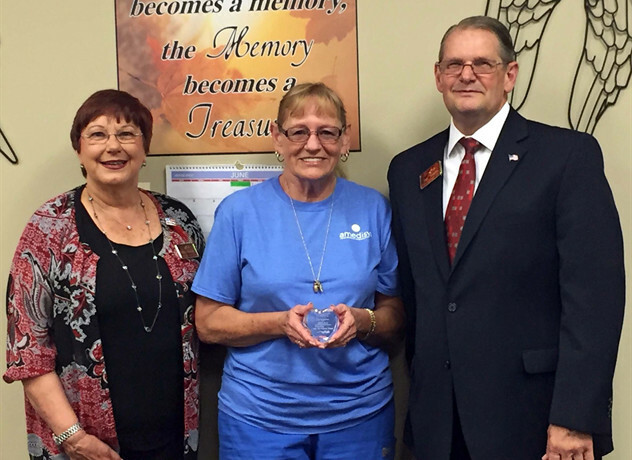 Anna Butler, Chaplain of Mountain States Health Alliance Hospice, is the winner of the October 2017 Hospice Caregiver Award, presented by Tetrick Funeral & Cremation Services. Many times the “backline” hospice caregivers do not receive a nomination because families don’t have as much direct contact as they do with the nursing staff. Anna Butler puts her heart and soul into her job of serving families. She dedicates herself to helping those in need of her care. She is always available to meet with and help a family member in giving spiritual wisdom and direction for their pathway. Anna also makes all of the arrangements for the two memorial services that MSHA holds each year at Tetrick Funeral & Cremation Services in Johnson City. No one realizes how much work and effort goes into creating and implementing this service to uplift and encourage the hearts of those who have lost a loved one during the past year. Congratulations, Anna for a job well done! November 2017 CAREGIVER OF THE MONTH IS Charlene jackson! 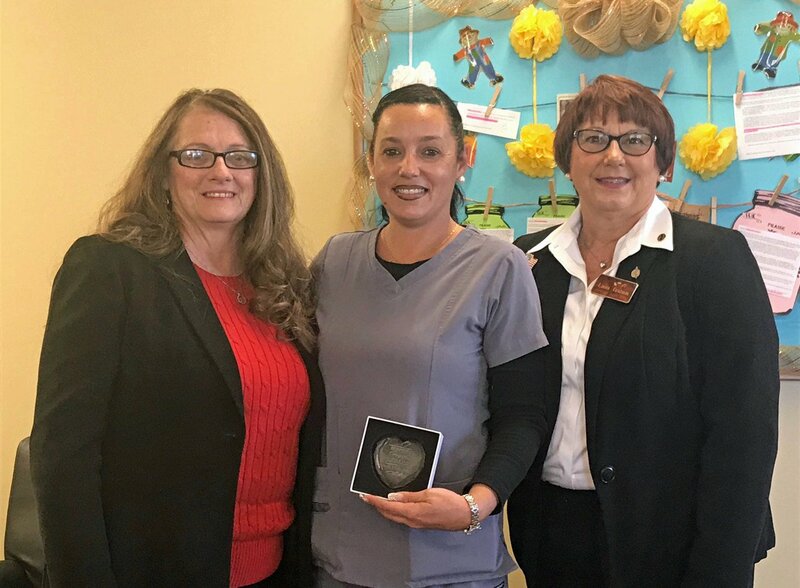 Charlene Jackson, CNA with Avalon Hospice in Johnson City, TN is the winner of the November 2017 Hospice Caregiver Award which is presented by Tetrick Funeral & Cremation Services. Charlene was very caring and extremely patient with my 97 year old mother. She helped me so much in caring for my Mom. Charlene could make my Mom smile and laugh but more importantly, Charlene was able to do her job without a big resistance from my Mom. To be able to accomplish this task was amazing at times. My Mom had to be lifted from bed to her chair and Charlene was just wonderful in doing this without putting Mom in pain. Charlene is a very compassionate woman. In fact, the entire Avalon team is just wonderful! After my Mom passed away and Charlene had to take care of other patients, I truly missed her as my friend. 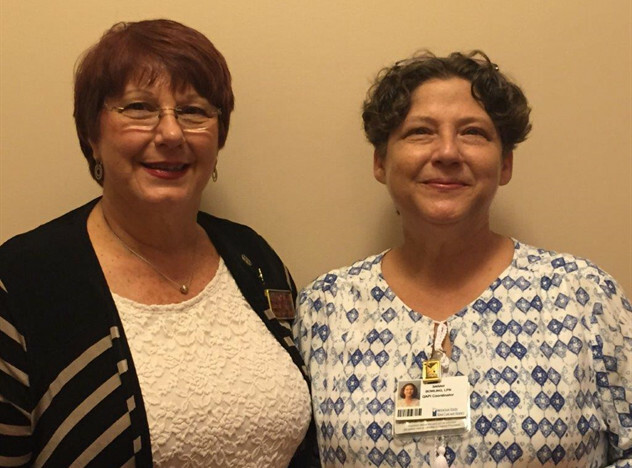 Charlene deserves to be the Hospice Caregiver of the Month because of her tireless and selfless and compassionate caregiving to those people she takes care of and to their families who depend on her to give excellent care to their loved one. Thank you for your service and dedication, Charlene! DECEMBER 2017 HOSPICE CAREGIVER AWARD IS BROOKE GRINDSTAFF! 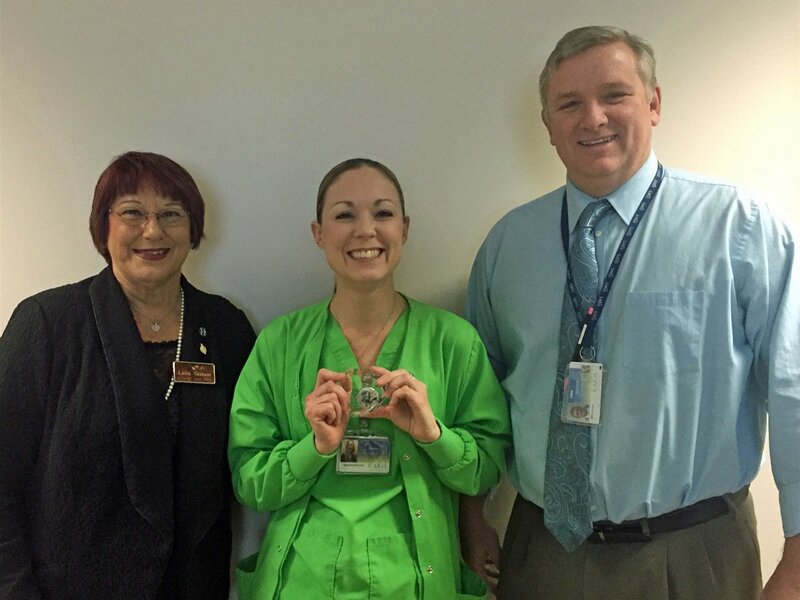 Brooke Grindstaff, RN with Caris Hospice in Johnson City, TN is the winner of the December 2017 Hospice Caregiver Award which is presented by Tetrick Funeral & Cremation Services. Brooke was nominated by two families. The first nominator was Jerry Coombs whose Father was Brooke’s patient and the other family nominators were Aimee Cloyd and Thomas Jeffery Minnich whose Mother was her patient. Mr. Coombs had the following to say about Brooke: Brooke was trusted and respected by my Dad who had severe COPD with lung and bladder cancer. Brooke had our attention from the get-go and we trusted her advice and care for my Dad during the duration. Her medical background was a plus in all aspects of my Dad’s care which included meds, sleeplessness, anxiety, nutrition, pain management and much much more. She was always prompt and always to be counted on for anything that was asked of her. Brooke was non-wavering in her duties as a professional and she was sympathetic as a person. 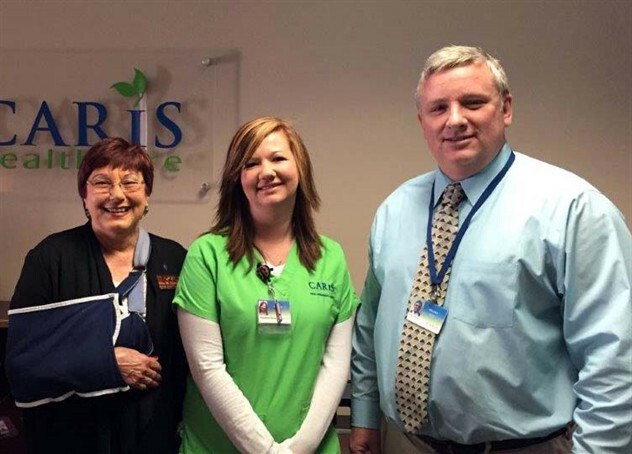 You cannot ask for better from Brooke and the ENTIRE staff at Caris. My family and I thank them for all they did and they will never be forgotten. She should definitely be acknowledged and it is my pleasure and honor to be allowed this opportunity to nominate her. Thank you. Sincerely, Jerry Coombs. Thank you for your service and dedication, Brooke! HOSPICE CAREGIVER OF THE YEAR FOR 2017 IS Brooks Monroe!